Edward Daniels wrote "to the Friends of Free Kansas" from the office of the National Kansas Committee in Chicago, Illinois, on December 1, 1856. 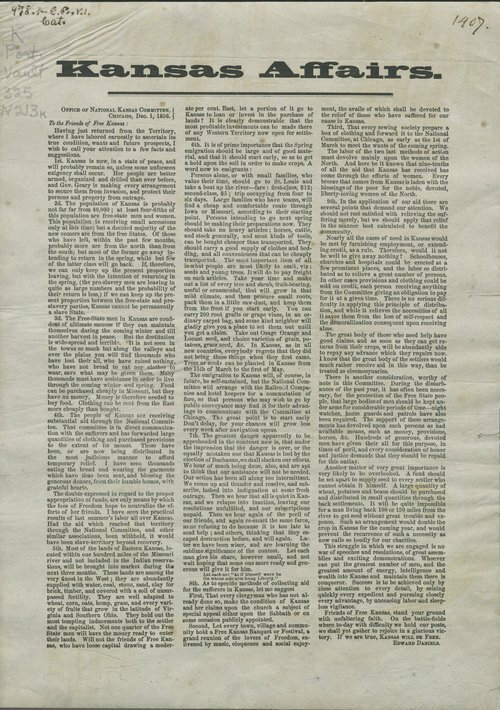 Daniels had just returned from the Kansas Territory, and presented nine "facts and suggestions" to explain how people in the East could provide support to free state settlers (including suggestions by which ministers and communities could raise necessary funds and/or provisions). Daniels believed that a large emigration of free state supporters was needed in the spring of 1857, and provided suggestions about what to take (including seed) and how to get to the Kansas Territory.